Nearly 320,000 students are enrolled in Arizona private colleges, and close to 355,000 are enrolled in public and state schools in Arizona. With more than 100 colleges and universities to choose from across the state, aspiring students should do their homework when it comes to trying to find the right college fit. Discover more about Arizona's colleges and online university options, find out the answers to students' frequently asked questions, and explore how higher education can prepare you to thrive in the workforce long term below. Some college-bound students in Arizona prioritize finding a school with a stellar student-teacher ratio, such as Arizona Christian University or Prescott College, where the student teacher ratio is lower than the national average of 14:1. Others might prioritize finding a college with an array of online degree programs, like the University of Arizona, where nearly 22 percent of incoming freshman come in as “undecided” majors with room to choose their path as they learn. Northern Arizona University has 158 degree programs and is the only state university in Arizona whose professional education programs are accredited by the Council for the Accreditation of Education Preparation. Northern Arizona University's online degrees are referred to as Structured and Guided or Self-Paced Personalized Learning. Structured and guided programs allow students to choose from a range of start dates and choose their own course schedules. Self-paced personalized learning programs do not require a set schedule or classes, giving students the opportunity to complete requirements for their bachelor's degrees at their own pace. NAU offers online technical support, library resources and tutoring. NAU also offers blended degrees which are completed partially on-campus and partially online. For additional flexibility, hybrid courses allow students to complete most of the work online while occasionally attending certain lectures and discussions on campus. Students should check with their academic or major advisor in order to see what options they have for hybrid and blended courses. Undergraduate students must complete 120 credits, core requirements and requirements for their major with an overall grade point average of at least 2.0 to obtain a bachelor's degree. Majors and minors require additional credits and courses. Bachelor's degrees are usually completed in 4 years. Graduate degrees require a minimum of 30 credits. Different master's degrees have different requirements - as an example, some programs require a thesis with at least 18 units of formal coursework, while those not requiring a thesis may require at least 24 units of formal coursework. Students looking to transfer will be granted admission to NAU if they have attended community college and completed specific Arizona education curriculums and have a minimum 2.0 GPA, 12-23 transferable credits and a high school GPA of at least a 2.0. Arizona State University offers more than 110 undergraduate and graduate degrees entirely online and serves more than 20,000 distance learners. While ASU offers bachelor's and master's degrees online, doctoral courses must be attended on campus. ASU has been established as a "top-tier" hiring and recruiting institution by over 50 top corporations around the country. In order to obtain a bachelor's degree at ASU, students must complete about 120 credits hours, with a minimum of 45 upper-division credits. Students must also achieve a minimum GPA of 2.0 while fulfilling the university's general studies and major requirements. Students can typically complete a bachelor's degree in 4 years, whereas completion of master's degrees varies by specific program. Students interested in transferring to ASU must have completed 12-23 transferable credits from a regionally accredited college with a cumulative GPA of at least 2.5, as well as meet freshman admission requirements. There may also be additional requirements for specific majors. As ASU is ranked as one of the top schools for veterans, military credits are accepted. ASU assesses how to transfer military credits using the American Council on Education's Guide to the Evaluation of Education Experiences in the Armed Services. ASU is accredited by the Higher Learning Commission of the North Central Association of Schools and Colleges. The University of Arizona offers innovative education to better Arizona as well as the rest of the world. UA is a long-time partner with NASA and has an emphasis on research. It offers over 300 undergraduate and graduate programs in a range of science and technology fields as well as liberal arts degrees. When it comes to distance learning, UA boasts over 150 degree programs that can be completed entirely online. Online students can obtain a bachelor's, masters or certificate. In order to graduate, students must complete at least 120 credits within a degree program, 42 of which must be upper division. Certain majors may have additional requirements. Students must also have a cumulative GPA of 2.0. The typical length of a bachelor's program is 4 years. UA accepts credits from regionally accredited colleges and universities, but these credits must meet certain additional stipulations. Academic advisors in the student's major department will determine whether a credit is eligible for transfer, and transfer coursework will not be averaged into the students' University of Arizona grade point average. Graduate students transferring to UA will also need approval from the graduate director and major/minor advisor in order for their credits to be accepted. In most cases, courses must be at the graduate level from accredited universities or colleges and must be above a B average. Veterans can obtain military credits by submitting past transcripts for evaluation. Up to 30 American Council of Education (ACE) approved credits may be applied towards an undergraduate degree. Recruit, basic training and knowledge of a second language may also be transferrable as credit towards a degree based on certain conditions which can be found under the transfer credits guide or through an academic advisor. Prescott College has a mission to produce leaders and global citizens to address the many issues facing our society today. In order to achieve this, the school emphasizes student designed programs and experimental education. Prescott is regionally accredited by The Higher Learning Commission and prides itself on its diverse population and services that promote diversity. The school also accepts undocumented students and veterans, and offers programs to support these groups. Students can earn their bachelor's, master's or doctoral degrees by attending programs on campus as well as online. In order to graduate, undergraduate students must complete at least 120 semester credits. The typical length to program completion is 4 years. For those interested in distance learning, Prescott offers the option of 100% online degrees as well as hybrid learning programs where students travel to campus for orientation and to work with mentors and faculty advisors. The master's degrees offered through distance learning include Adventure Education, Education, Environmental Studies, Humanities and Counseling. For an online PhD, students can pursue Sustainability Education. Transfer students may be drawn to Prescott College for its generous transfer policy as well as the ample support services. At a minimum, transfer students must complete two terms of full-time enrollment at Prescott College or the equivalent. The school accepts higher level college course credits from accredited universities, CLEP (College-Level Examination Program) tests, as well as credits via programs verifying US military services training so students don't have to retake introductory courses. There's also the option to apply to Prescott's Accelerated master's program to more efficiently and quickly finish a bachelor's degree and a Master of Arts, Master of Science or Masters of Education. How can I find which online colleges offer the degree I'm looking for in Arizona? Arizona’s colleges and universities offer a wide range of undergraduate degree options, many of which are fully online. The Arizona Commission for Postsecondary Education provides a listing of all the state’s private and public higher education institutions, along with detailed information on course offerings and the length of study required at each. Many colleges, like Northern Arizona University, specifically list their distance education programs on their websites. With online programs ever-evolving, the best way to know which schools offer the degree you're interested in is to call the admissions office or check the college’s website. To narrow down all the accredited colleges and universities in Arizona, click the search button to the right. Which online schools in Arizona will accept my transfer credits or work/life experience? Most Arizona schools have their own guidelines to help transfer students determine if their credits will count towards a new degree program. For instance, Arizona State University offers a transfer credit guide that allows students to evaluate their eligibility-credits may transfer if they were earned at a regionally accredited institution. Regarding work/life experience, college and university policies in Arizona may also vary. The University of Arizona will recognize work and life experience credits that are validated by testing, such as the College Level Examination Program (CLEP). Many online colleges and universities in Arizona may also offer military experience credit for students who want to earn their degree after military service and business- or industry-specific credit for working students. How Much More Do College Grads in Arizona Make? In Arizona, completing an online degree can increase your earning potential down the road. Let's examine the average pay college graduates in Arizona can expect, based on their degree level. On average, Arizona residents with a master's degree can make almost $42,000 more per year than residents working in jobs that require no formal education, and those whose jobs require a doctoral or professional degree might make $87,000 more per year. The statistics also make a strong case for Arizona students who already have an undergraduate degree, as Arizona’s careers that require a doctoral degree pay $46,000 more on average than careers requiring a bachelor's degree. Arizona's economy is anticipated to grow over the next three decades. Most of the state's job growth during this time is projected to take place in the service-providing sectors, including health services, education services, utilities, trade, transportation, and business and professional services. These industries make up more than 60 percent of the projected growth. There are online college programs offered in Arizona associated with these fast-growing industries. If one of these fields interests you, the next step is to learn more about the degree and career prospects within healthcare, education and business sectors, and match them to the college of your choice. Online higher education is on the rise in Arizona, especially as the state grapples to find solutions on how to better fund colleges and universities. But not all Arizona’s online schools are equal. Students should seek out colleges that are accredited—accredited institutions must consistently meet certain requirements to demonstrate that they provide a top-notch education. Colleges and universities can be accredited by both national and regional bodies, but regional accreditation is considered more prestigious. For example, Arizona State University, who has a broad online program base, holds their general, regional accreditation from the Higher Learning Commission of the North Central Association of Schools and Colleges. In addition to regional accreditation, some online colleges in Arizona have earn subject-specific accreditation for individual programs. Arizona State University is one who also holds these additional specialized accreditations; the Commission on Collegiate Nursing Education accredits their nursing programs, including their online nursing degree. Tuition costs have climbed across the country over the past 30 years, and many Arizona students in are concerned about their ability to afford a college education. In Arizona, online tuition rates vary by school, and even by program. However, some online colleges in Arizona charge their distance learners in-state tuition rates regardless of where the students live. 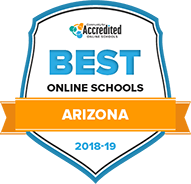 This allows online schools in Arizona to market their individual programs across the United States and meet the needs of a much wider student demographic. For example, Arizona State University charges $520 to $728 per credit hour for undergraduate students online, and there is no out-of-state tuition. Arizona is a part of an agreement called the Western Undergraduate Exchange, where out-of-state students from participating states can attend Arizona colleges and pay a discounted tuition rate, rather than the more pricey, out-of-state tuition rate. This is a major benefit for students in other states who may be interested in earning an online degree from an Arizona college. Let's take a look at a few frequently asked questions about paying for online colleges in Arizona. What are Arizona's requirements to qualify for in-state university tuition? To quality for in-state university tuition, students must live in Arizona for an entire year before applying for college. They must also demonstrate that they intend to establish an Arizona domicile (live permanently in the state) rather than only live in the state as a student. Are online credits more affordable in Arizona than other places? Larger institutions like the University of Arizona charge online students between $500 and $600 per credit, or a minimum of $13,300 per year for tuition and fees for a bachelor’s degree. By the numbers, this puts Arizona's tuition costs below the average total tuition cost in the United States for public colleges, which comes out to more than $16,700 per year. How can I get help paying for online college in Arizona? Arizona BPW Foundation Scholarship: This $1,500 scholarship is available for women ages 25 and older who are returning to college to advance their careers. The scholarship is available through the Arizona Business and Professional Women's foundations. PepsiCo Cesar Chavez Latino Scholarship: Students of Latino descent in Arizona can take advantage of this $5,000 scholarship to start or continue their higher education studies. Winners must complete 30 service hours with the Cesar Chavez Foundation within a year of receiving the award. Arizona CPA Foundation for Education and Innovation Scholarship: This scholarship is available to any Arizona resident who plans to enter college full time. It is specifically reserved for students who intend to major in accounting. To search for additional scholarship and financial aid information, click the icon to the right. Adult education programs are an excellent resource for students who could use some additional stepping stones to reach their college degree. From July 2016 to June 2017, more than 13,000 Arizona residents participated in these adult education programs, primarily students who were 25 to 44 years of age. Completing High School Equivalency: Arizona students seeking their high school equivalency diploma can do so as they also earn college credits by applying for the College Credit Pathway program. Transferring to a four-year college or university: The AZ Transfer program offers college advice on transferring to Arizona’s major universities, as well as counseling on college preparation and earning general education equivalency credits. Earning work experience after college: For degree earners who are pursuing higher education to advance an existing career, the Arizona@Work program offers career workshops and internship and apprenticeship connections.